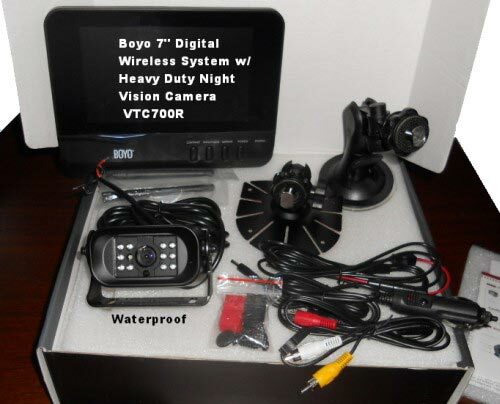 Designed for Tractor Trailers and other Large Trucks, the Boyo Digital Wireless Camera System is Easy to Install. Simply use an inexpensive 12 Volt Tester like the one in the picture at the bottom of this page to find the circuit for the backup lights. Tap the 2 leads to the Camera into the backup light circuit. Plug the Display into the lighter. 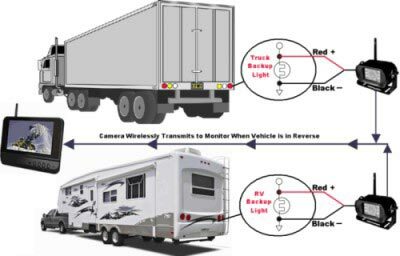 Whenever you place the vehicle into Reverse, the backup light circuit is supplied with 12 Volts, which also supplies 12 Volts to the Camera. 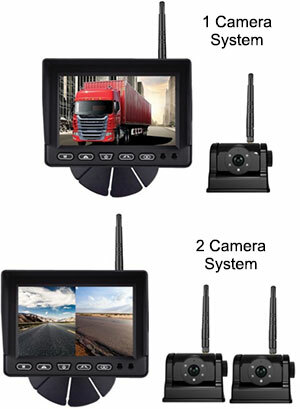 When ever the Camera receives 12 Volts, it will transmit the video signal wirelessly to the Display. The Night Vision Waterproof Camera can transmits up to 400 ft.
How many Cameras can you purchase for the price of preventing 1 accident? Even a fender bender can cost you thousands. There is a place to scrimp and a place not to. Safety is definitely not the place to scrimp. Be smart, get a backup Camera on all of your vehicles now. Night vision distance up to 16 ft.